Bollywood was shocked beyond belief when Arbaaz Khan and Malaika Arora ended their 18 years of marriage. After two years, both, Arbaaz and Malaika have moved on to better things and other people in life. Remember Malaika’s infamous whirlwind romance with Arjun Kapoor? 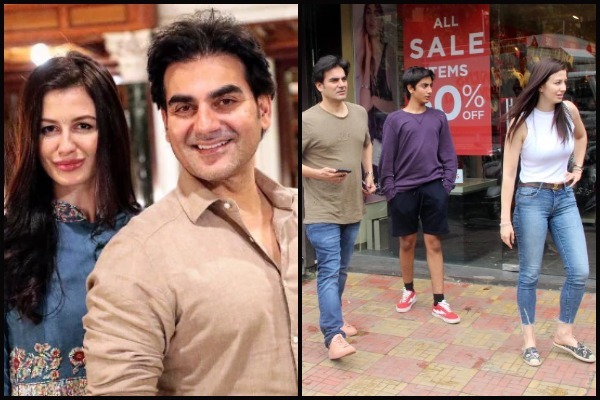 While the ex-couple extremely cordial with each other due to their son Arhaan Khan, looks like wedding bells might be ringing soon for Arbaaz Khan! As per several reports Arbaaz Khan is all set to tie the knot with his model girlfriend Giorgia Andriani! Reportedly, Arbaaz and Giorgia have been in a serious relationship since the past few months. According to reports the much in love couple wants to waste no time in making things official between them. Arbaaz and Giorgia have been spotted several times together. Be it on lunch or dinner dates or outings with the Khan family. Just recently Arbaaz and Giorgia were spotted having lunch with Arhaan in Bandra. This is not all, the couple was also spotted enjoying a dinner outing with Arbaaz’s former sister-in-law Amrita Arora. The wedding rumours started circulating in full force when Giorgia was seen attending Arpita Khan Sharma’s birthday bash in Hyderabad. Karisma’s Beau Sandeep Toshniwal Divorce Finalized. Karisma Kapoor & Sandeep Toshniwal To Marry? Arbaaz too on Giorgia’s birthday shared a stunning picture of through his Instagram story with a heart emoji. While the model’s Instagram account is full of her pictures but the occasional few pictures with Arbaaz Khan certainly do not dull down the wedding rumours. It is reported that the Khan Khandaan has given the green signal to Arbaaz Khan to make things official with GiorgiaAndriani. As per reports, it is only a matter of time before we will be hearing wedding bells ringing for Arbaaz and Giorgia. Earlier there were rumours that Arbaaz is dating a Goa based restaurateur, however it was past. At present Salman Khan’s brother Arbaaz Khan has found his love in Giorgia. Previous : Shahid Kapoor’s Wife Mira Rajput Trolled For Endorsing An Anti-Ageing Product At 23!